If you’re a golf newbie, you have a lot to learn. One of the first things you need to learn is that not all golf balls are created equally. Some of them are hard, some of them are soft, some of them are designed for seasoned players, and some of them are designed for beginners. Are you a beginner golfer? Looking for the proper equipment? Not sure of what to look for in a golf ball? If so, this guide can help. Not only will it explain what features to consider in a golf ball, but it will also provide you with a compilation of the 10 best golf balls for beginners. There are all types of golf balls available on the market today, each of which possesses its own individual identity. Some of the best beginner golf balls are as follows. Coming in packs of 12, the Titleist Velocity golf ball offers top-notch performance at a mid-level price. Possessing an enlarged LSX core as well as 328 dimples, it’s specifically designed to travel long distances in the air. However, this doesn’t mean that it performs poorly around the greens. Despite its propensity for distance, it still offers plenty of spin. All in all, it’s one of the best golf balls for beginners. The Nike Golf PD Long Power golf ball is one of the best nike golf balls around. Possessing 314 dimples in addition to a high-velocity core, it’s created to travel long distances. Available for a mid-range price, it can rightly be considered a high-end ball for a beginner golfer. If you’re interested in a relatively soft golf ball, you might consider these balls from Pinnacle. Possessing 332 dimples, they offer a good amount of distance without sacrificing too much in the way of control. Arguably the best golf ball for seniors, they perform excellently around the greens. Another high-quality soft golf ball is the Callaway Supersoft. This 2-piece golf ball possesses shallow dimples, allowing it to fly long distances while still providing a soft landing. Available for a mid-level price, these are some of the best golf balls for high handicappers. They should help you to improve on every aspect of your game. If you’re looking for a bunch of golf balls at a budget price, you might consider going with the Wilson Smart Core Golf Ball. These golf balls come in packs of 24 but are available for the price of a typical budget 12-pack. This isn’t to say that these are bad golf balls. While they’re not on the level of the balls reviewed above, they still offer plenty in the ways of distance and feel. In terms of quality, these Strata balls are right on par with the Wilson balls reviewed above. While they aren’t exceptional, they’re more than good enough for beginners, offering above-average distance, in particular. Coming in 24 packs, they’re available for a reasonable price. The Callaway Warbird offers great value for its price. Possessing a highly compressible core, it is capable of traveling staggering distances. Nonetheless, it still supplies plenty of feel, allowing you to thrive around the greens. All in all, regardless of your experience levels, these are some good golf balls. If you’re looking for a 3-layer ball at a reasonable price, you might consider going with the TaylorMade RBZ. This is a relatively soft golf ball that is also capable of good distance. Possessing a compression rating of 70, it’s a great option for golfers who like to swing easy. In search of some good cheap golf balls? Why not give the Wilson Ultra 500s a try? These balls come in packs of 15 and are available for a relative pittance. Though they’re not on the level of the highest-rated balls on our list, they’re more than good enough to get the job done. 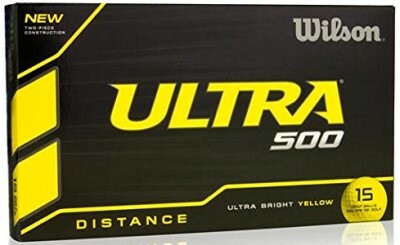 The last golf ball on our list is the Nitro Ultimate Distance Golf Ball. Coming in packs of 15, this golf ball is available on a budget. Sporting a two-piece construction, it offers top-notch distance capabilities but struggles a bit in terms of overall feel. When buying golf balls, there are a few different things you’ll want to consider. They include hardness, cover material, construction, and dimples. We’ll get into a little more detail below. Golf ball hardness is measured by compression. Compression refers to the extent that a ball contracts when it is struck by a golf club. All golf balls are assigned a compression rating of between 0 and 100. Most golf balls fall somewhere between 50 and 100. Generally, if you have a hard swing, you should utilize golf balls with lower compression ratings (50 to 60). If, on the other hand, you have an easy swing, you should opt for something between 60 and 100. These days, golf ball covers are generally made out of one of two materials: surlyn and polyurethane. Both materials possess their very own benefits, but their very own drawbacks as well. Whereas surlyn is known more for its distance, polyurethane is known more for its control. For most beginner golfers, surlyn is the way to go. This is because most beginners aren’t skilled enough to take advantage of polyurethane’s superior ball control capabilities. In general, golf balls possess one of four types of construction: one-piece, two-piece, three-piece, and multilayer. Generally, the more advanced you become, the more layers your golf ball should contain. It should be noted, however, that one-piece golf balls are only good for the driving range. Most beginners will be best accommodated by a two-piece. For some individuals, however, a three-piece will be the best option. Few things affect the quality of a golf ball more than its dimples. The dimples of a golf ball are the small craters which exist all along the outside of the ball. These dimples exist to reduce the amount of wind resistance the ball has while in the air. Golf balls can have any number of dimples. However, most golf balls have between 300 and 500. Ideally, you’ll choose a ball which has between 300 and 380 dimples. As a beginner, distance is going to be your biggest goal. You can worry about backspin and ball control as you become more advanced. . In short, we recommend opting for a ball with few dimples: 300 to 350.